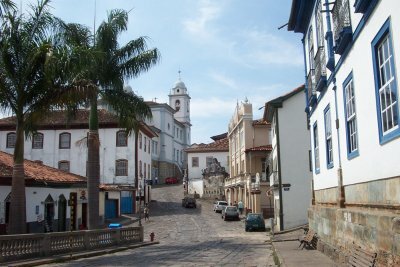 The Historic Centre of the Town of Diamantina comprises a city landscape adapted from European models to an American context. The city's history began in 1713 when an expedition found diamonds on the mountain slopes and along the rivers in this region. A first settlement was started, Arraial do Tijuco. In 1731 the Portuguese Crown became aware of its wealth, and set up a seperate body to administer the region. Mining rights were granted to private enterprises at first, but soon the Crown took back ownership. Mining blossomed in Diamantina in the 18th and early 19th century. After that, richer and better quality deposits in South-Africa were found. 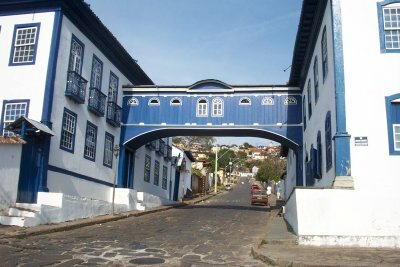 Because of this, the historical center of Diamantina has been preserved very well. 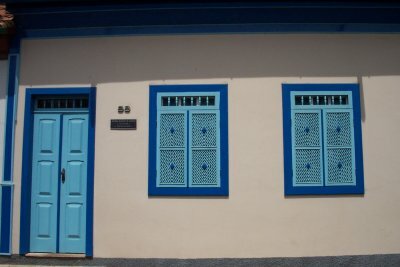 Some distinct features set it aside from other Portuguese colonial towns (and they can still be seen today): its pavement (large grey stones called capistranas) and the use of wood and adobe on the walls of its houses. Diamantina really is very different from Ouro Preto for example, and not just another mining town. It's smaller (the historical remains can only be seen in the center of the current city) and more sober. I found that it has some basic beauty. There were quite a number of Brazilian daytrippers around, but I didn't see any foreign tourists. Maybe that's because it takes 5 hours to get here by bus from Belo Horizonte, not the center of the world itself. It's quite a lively town, with music played in the streets and a number of good restaurants. And (of course) the Diamond Museum. Here you can see some real diamonds (there's a very strong man with a gun guarding them, and selling the entrance tickets). Also there are paintings that depict how the slaves had to do the digging, and how their masters lived. In the town center there are a number of good sights. I liked the pure and simple Igreja do Rosario. And also the small houses along the street from there to another church, do Carmo. Not to be missed too is the very blue passageway at the Casa da Gloria. Diamantina is a pleasant enough colonial town, but is not in my opinion in the same class as Ouro Preto or even of a number of other non-inscribed colonial towns in Minas Gerais such as Tiradentes. It hovers between “worth a detour” and “worth a visit” if you have the time and want to clock up another WHS. The trouble is that it is somewhat isolated from the more frequented tourist areas south of Belo which can be passed through on a “natural route” and a “detour” to see it is quite long. If you decide to go there you will probably have to accept doing a return journey on public transport which could involve a couple of days. We avoided this by renting a car from Belo having bussed in overnight from Brasilia (if you do this go out to the closer and less busy Pamphula airport and “play the field” for a good deal with the range of rent-a-car companies there. While you are there visit the nearby Tentative List entry of “Ensemble architectonique de tourisme et loisir au bord du lac de Pampulha”) and were able to get up to Diamantina that morning AND back to Ouro Preto for that evening. A bus from Belo will take up to 6 hours each way (there are apparently ways of avoiding a return journey on public transport by changing at Curvelo near the Belo - Brasilia highway). Diamantina’s relative isolation means that it is considerably less touristy than Ouro Preto etc. We however found it quite bustling with traffic (if anything more so than Ouro Preto). There is the usual selection of Baroque churches, colonial mansions and cobbled streets. 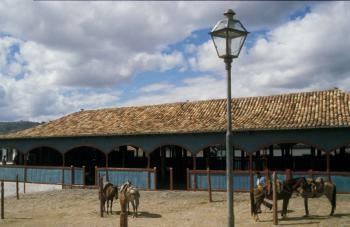 The market square and its wooden building dating back to 1838 (photo) is perhaps its most unusual and “atmospheric” sight with the horses (belonging to the stallholders?) “parked” outside (though I had to work hard to avoid getting any cars in the picture!). It is said (though I have never seen “first hand” evidence) that this building with its archways was used by Niemeyer as inspiration for the Palacio da Alvorada in Brasilia (He was in Diamantina for the design of the Hotel da Tijuco). As you approach by road you get a feeling for the wildness of the countryside around Diamantina and, with more time, it might repay exploration – but we didn’t. Designed by Oscar Niemeyer: Hotel do Tijuco (1951), and several other works in the town - including a School (1954) and a Club (1950). Slavery: Its mines were worked by slaves. It was also the home of one of Brazil's most "famous" slaves who has become a soap opera figure "Chica da Silva"